Between the girls starting school and taking care of the newest member of the family (doberman pinscher puppy – Barron!) I found myself with no time to pick out my clothes in the morning. 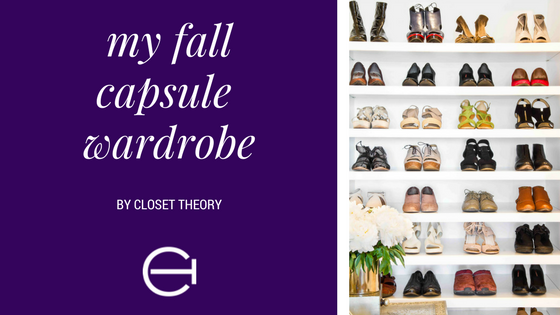 I had heard about building a capsule wardrobe before and never thought I could make it work. But this fall, I am giving it a shot. Coined in the 70’s by London boutique owner, Susie Faux, a “capsule wardrobe” is a collection of a few essential items of clothing that don’t go out of fashion, such as a black sheath dress, grey trousers and plain t-shirts, which can then be interchanged with seasonal pieces. The purpose of the capsule wardrobe is to eliminate clutter so you can easily mix and match. Think in layers to create different looks and buy quality pieces that will last a long time. You’re going to be wearing most of these things regularly for 3 months and some for longer than that. Your capsule should contain about 35 pieces per season. What should not be included in your capsule? Loungewear, sleepwear, workout clothes, undies, a special occasion dress and accessories. But this doesn’t mean you have free reign of the jewelry department. Control yourself, ladies. Here are my picks for a fall capsule wardrobe that will take me from a meeting with a client to one with the PTA and the farmer’s market on the weekend. What would be on your essential items list? This entry was posted in Fashion, Organization and tagged Autumn, Black, Blush, Capsule, Fall, Fashion, Grey, Purple, Wardrobe. Bookmark this page.